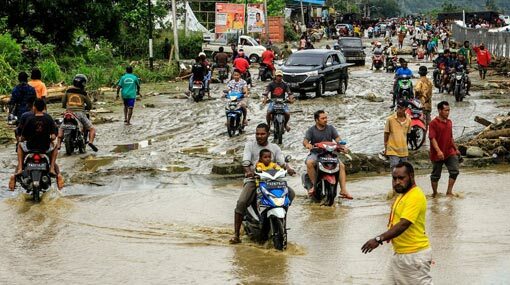 Flash flooding in the Indonesian province of Papua killed at least 50 people and injured 59 near the provincial capital, Jayapura, disaster officials said Sunday. By Sunday morning, videos showed people walking along a major street that was covered in mud. Nearby were damaged houses and debris from the flooding. One video showed an airplane lying flat in the mud. Indonesia has suffered a string of disasters over the last year that have claimed thousands of lives, including an earthquake and tsunami on the island of Sulawesi; a volcanic eruption and tsunami in the Sunda Strait; an earthquake on the resort island of Lombok; and the crash of a Lion Air jetliner into the Java Sea.